The Theriaka and Alexipharma by Nicander is one of the most interesting manuscripts from Byzantine illumination as it is the only surviving example illustrating the work of Nicander. The codex was written and illuminated in the 10th century and with 40 of its 48 leaves featuring beautifully drawn illustrations it is justly considered, from an artistic standpoint, an outstanding work. Nicander - who lived in the 2nd century BC in the kingdom of Pergamum - was a physician, a grammarian, and a poet so it does not come as a surprise that the manuscript, despite its medical contents, is written in verse. The list of Nicander’s formulae was increased and developed in later centuries by very popular physicians such as Mitridates who added the use of opium and herbs as remedies, Crito and Andromache, respectively Trajan’s and Nero’s physicians. This feature belongs to a genre that is commonly known as didactic genre which entails having a difficult concept (often science-related) made of more easy interpretation with the use of verse. While the Theriaka is concerned with poisonous insects and wild animals (absorbable only through the skin), the Alexipharmaka deals with oral poisons which originate from plants and minerals, and in both works, the necessary antidotes are provided. the appropriate remedy or antidote. a list of appropriate remedies. 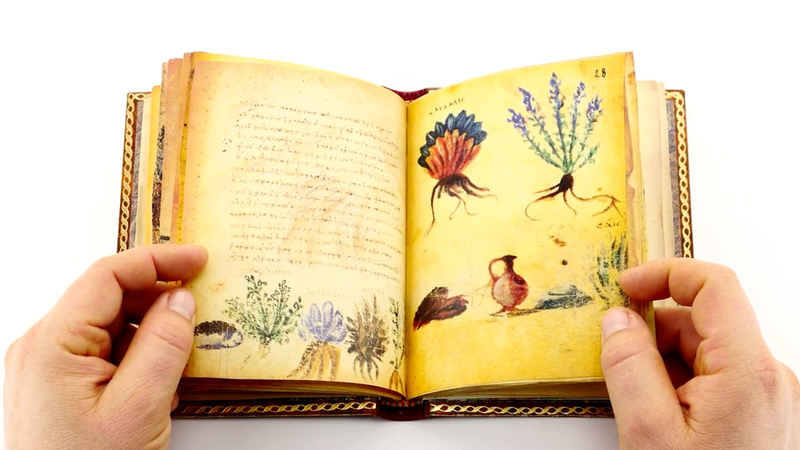 The Theriaka and Alexipharmaka by Nicander feature, in terms of its iconographic apparatus, an elegant and original sequence of well-illustrated miniatures. Human figures and outstanding zoological and botanical images alternate along the text and in the text, for the illustrations lack – as it was customary at the time of production of the manuscript – framing elements allowing the miniatures to create a discontinuation. The illustrations are a great visual support to the text for they depict what is described in the actual texts, ranging from depictions of wild animals to antidotes to mythological accounts. Manuscript book on parchment − 16 × 12.5 cm − 96 pp. We are not official distributor of this publisher. We do, however, supply pre-owned, like-new copies of their publications. Full-size color reproduction of the entire original document, Theriaka and Alexipharmaka by Nicander: the facsimile attempts to replicate the look-and-feel and physical features of the original document; pages are trimmed according to the original format; the binding might not be consistent with the current document binding. Marble design, brown leather with red spine.